I recently reviewed the Benchmade Griptilian, a model I consider to be a classic Benchmade knife. The Benchmade 710 is another one of those classic Benchmade knives. The 710 was designed by knife makers Bill McHenry and Jason Williams. This is a father and stepson team that invented the Axis lock. They subsequently and then sold the rights to the Axis lock to Benchmade. Benchmade asked McHenry & Williams to design a knife to feature this new locking mechanism and the 710 is what they came up with. The 710 is the first Benchmade knife to ever feature the Axis lock. Since it’s introduction the 710 has received a lot of praise. Most notably the 710 earned the Shooting Industry Magazine’s Knife of the Year Award after it was introduced in 1999. Needless to say both the 710 and the Axis lock went on to become big hits, and now more than a decade later both the knife and the locking system are still wildly popular among users and enthusiasts alike. The 710 is on the large side. The overall length is 8.8″ with a 3.9″ blade, a blade thickness of .115″ and a weight of 4.5 ounces. Obviously this is not a feather light every day carry (EDC) blade. Personally I find this more of a “nights and weekends carry” when I can carry a bigger knife. That said I know plenty of people EDC the 710. The blade is a modified clip point shape with an elegant unsharpened swedge that comes to a fine point, ideal for piercing and thrust cuts. The edge has a slight recurve which helps with draw cuts and allows the already long blade to perform like a slightly larger knife. The 710 has a hollow grind which begins high on the blade and makes this an excellent slicer. Benchmade went with D2 steel for the blade. D2 is a “semi-stainless” high carbon tool steel known for its toughness and edge retention. Benchmade has heat treated the blade to a rockwell hardness of 60-62 which is quite hard, especially before the introduction of super steels like S90V. The nice thing about D2 is that it can actually handle this kind of hardness without becoming brittle and chippy. One potential issue with D2 is because it is such a hard and tough steel it is more difficult to sharpen. The recurve doesn’t help. This is the kind of knife that you will want to maintain regularly. Allowing this knife to get completely dull will make it difficult to resharpen without diamond stones. I would recommend a Spyderco Sharpmaker with diamond rods to maintain this knife. While I am able to keep a decent edge on my 710, I readily acknowledge that it is not the easiest knife to sharpen. Another potential issue is corrosion. Like all steels, D2 can rust. D2 has a high chromium content, which helps to prevent rust, but there is not enough chromium to classify it as a stainless steel. D2 is comprised of approximately 12% chromium, and a stainless steel is usually classified as 13% or above. This is why D2 is often referred to as a “semi-stainless” steel. Regular cleaning and a little preventative maintenance will go a long way to combating issues with corrosion. However, you can see in the pictures of my knife some patina and staining that has formed. The 710 has a G10 and stainless steel handle with a Fiberglass Reinforced Nylon (FRN) backspacer. The 410 stainless steel liners have been skeletonized to reduce the weight and the machined G10 is very handsome. Generally, I like the handle a lot, although I do have some criticisms. First of all, I prefer open (pillar) construction with my handles. It makes the knife much easier to clean so to see a FRN backspacer here is a bit of a disappointment. That said, this isn’t a deal breaker and ultimately what we have here is a very strong handle. What may be more concerning is the texturing on the G10 handle. The texturing is not that aggressive and the handle can become slippery when wet. On a tactical knife, this bothers me. Also, there isn’t a finger choil, which again can compromise the integrity of your grip. The McHenry and Williams flared the handle (in both the thumb ramp and finger choil area), this does help the grip, even in the absence of any functional jimping (which is typical for Benchmade and not an issue for me). If you are seriously considering the 710 as a weapon, I would try one out in person before committing the $140+ this knife retails for. That said, the handle feels great with it’s rounded edges and lightly textured scales. For an EDC / user knife, the handle will be adequate for most purposes. I imagine Benchmade went with a slightly less grippy texturing to give the knife a more refined look and in order to appeal to a wider audience. The pocket clip is a standard blackened Benchmade clip. The 710 allows for ambidextrous tip up carry. Some might lament the lack of a “4 corners” pocket clip, but personally, I only use tip up anyways so this is not a big deal (I’d love to hear some comments if this is truly an issue for you). The knife rides low in the pocket, with about a half inch of the handle poking out of the top. For me, this is perfect. I like something to grip onto when I am trying to pull the knife from my pocket. Not a whole lot needs to be said here, the deployment and lock of the 710 is excellent. This is largely due to the Axis lock and Benchmade’s stellar quality control. If I was writing this review back when the 710 first came out, this probably would have been the longest part of the review, but the Axis lock has been proven and I have written at length about it. Just to cover a couple points however, the axis lock on the 710 is as smooth as butter. The knife has beefy phosphor bronze bushings which provide a low friction environment to allow the blade to fly out when deployed. With a little practice this knife can deploy almost as fast as an automatic. The lockup is very solid with out any play. I’ll also say the blade retention on this knife is also very good so you don’t need to worry about it accidentally opening in your pocket. The Benchmade 710 is a true workhorse of a knife. I have put my 710 through a lot over the years, and it has never failed me. It’s large and comfortable handle matches up to an equally large and sharp blade. The end result is a tool that is ideally suited for outdoorsmen, law enforcement, and military personnel. I enjoy the simplicity of the 710. It sort of reminds me of Glock handguns. It’s not a fancy design, but it works, and it forged the way for many excellent Benchmade knives featuring the axis lock. With that said, the 710 is far from perfect. D2 steel was probably a great choice back when this knife first came out, but these days there are better options. Also the recurve makes this knife more difficult to sharpen. The recurve adds subtle elegance to the 710, but I’d be willing to sacrifice some classiness for ease of sharpening. Finally, the texturing on the handle is a little weak. For a work knife I’d like to see grippier G10. The 710 is a classic with much deserved reputation. This is a design that has stood the test of time, and is still an excellent knife after all these years. At the end of the day, the 710 it cuts well and feels good in the hand. What else do you need from a big folding knife? If you are a fan of folding tactical knives, then you should check out the 710 at some point. This modern classic still gets the job done. I recommend purchasing the 710 from Amazon. Buying anything through any of the links on this website earns BladeReviews.com a small commission (at absolutely no cost to you) and helps support the site. Any and all support is greatly appreciated. Thank you very much. It would probably have been an improvement on the scales if there was a bit of contour like the 860 or the 580. I think all larger flat knives could use a bit of curve across the handle, even though it bulks them up a bit. Sometimes the straight slab construction seems like a bit of a cheat… With that said, it’s both a classic and an over all beauty. I’ll surely buy one at some point! I think a little more contour would definitely make this knife feel a little better in hand. As one of the older and more enduring designs I love it’s classic appeal, but it would be very cool if Benchmade updated it a little with some of their sculpted scales. I’ve bought my NIB LE 710 for $200+ here in Russia, but I guess that prices should be much lower in the US. Thanks for the great comment man. That is very interesting to hear that your LE version is of higher quality! I have not had a chance to play around with many Limited Edition Benchmade’s yet so that is quite a surprise. I’ll have to hunt around and see what a 710 in M390 would cost, it might be a little under $200 but that’s if you can find one! BM also produced “regular” m390 710’s, which I found similar to the D2 ones in every aspect (except for the blade material of course). model 710 introduced the world to AXIS for unprecedented features an ambidextrous hand. Greetings Dan, I just bought one ten min. ago on Ebay. Black G10, plain edge all black ATS-34 blade. Never used, never carried, in great condition. I’m going to try doing it once I receive the knife. As always, great to visit your site. Congrats on the purchase, man! The 710 is a real workhorse and I hope you end up enjoying it. I like the modification you linked to. It’s subtle, but it should help you get at the thumb studs a little easier. If it works, then I think BM should have done that right in the factory. If you get a chance, let us know what you think of the knife and the modification after you have had some time. Thanks for stopping by and for leaving the cool / informative comment. I love the concept of the 710 but can’t seem to pull the trigger on it after hearing about sharpening the recurve. Is it easy enough the touch up with a Sharpmaker like mine? Any advice would help, thanks! Not going to lie, this is one of the more difficult knives to sharpen. D2 can be pretty stubborn and the recurve doesn’t help. I struggled to get an edge I was 100% satisfied with on my 710 with the Sharpmaker. Thanks Dan still going to pick one up! Such a gorgeous knife to have in the collection! Keep up the great reviews! My 710 is ATS-34 sharpens very well. Hey man, thanks for the advice! is this model being discontinued? I don’t think so. 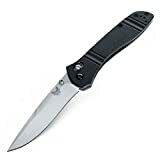 This is a classic for Benchmade and one of their best sellers. The first to have an axis lock. Hard to believe they would discontinue it. Where did you hear this? That’s what I thought too but I came accross this website called “Knifeworks.com”. “This items is being discontinued by Benchmade” under the price. Again, thanks for replying to my comment. Hi Jonathan, Very interesting. Thank you. I’ll look into it further. It does in fact seem Benchmade no longer offers the 710 on its website. The question now is simple, have they lost their minds at Benchmade? Such a classic folder.. Shared, If I grab it by the tip of the blade I can muscle out a little play. The closer to the pivot, the less play.